Alligators. Quick, mean and terribly dangerous. Fake lawn ornament alligators. Slow, mean looking but not dangerous at all. Police apparently can't tell the difference between the two because they tried to gun down a fake alligator. To be honest, I'm totally kidding myself. I've never seen an alligator before so I'd be scared shitless, real or fake. Children in a suburban Kansas City pond are apparently just like me because they spotted the fake alligator and alerted the police. 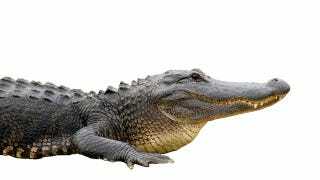 A conservation agent gave police the go ahead to kill the alligator if they thought the gator was dangerous. I'm assuming the police thought the gator being "partially submerged in weeds and looked real in the growing darkness" meant dangerous. They fired off two shots to its head until they realized the bullets were bouncing off of it and the alligator was actually made of concrete.